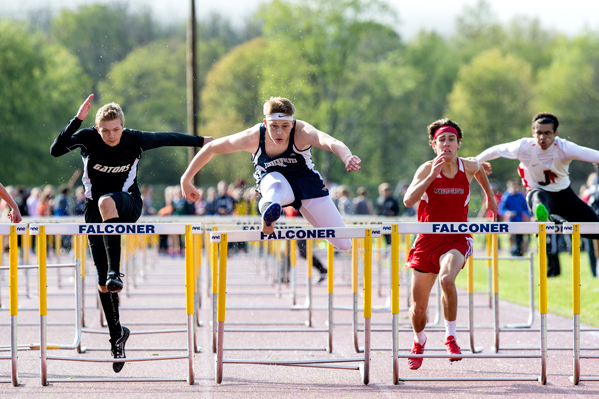 FALCONER — Jared Yaggie was named the Outstanding Boys Track Athlete as he led Southwestern to the boys championship at the 16th annual Golden Falcon Track & Field Invitational, which was limited to nine events due to inclement weather Friday evening. 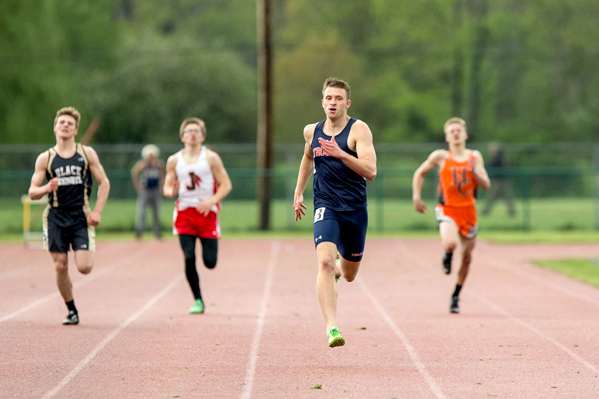 Yaggie won the 400-meter dash (50.64) and was second in the 100-meter dash (11.47) while Kellen Martin was the Outstanding Boys Field Athlete for Cattaraugus-Little Valley after winning the 110-meter hurdles (16:06) and the long jump (19-5 1/2). For the girls, Amber Morrison of Falconer/Cassadaga Valley captured the shot put with a toss of 36-5 1/2 and was named the Outstanding Girls Feld Athlete. 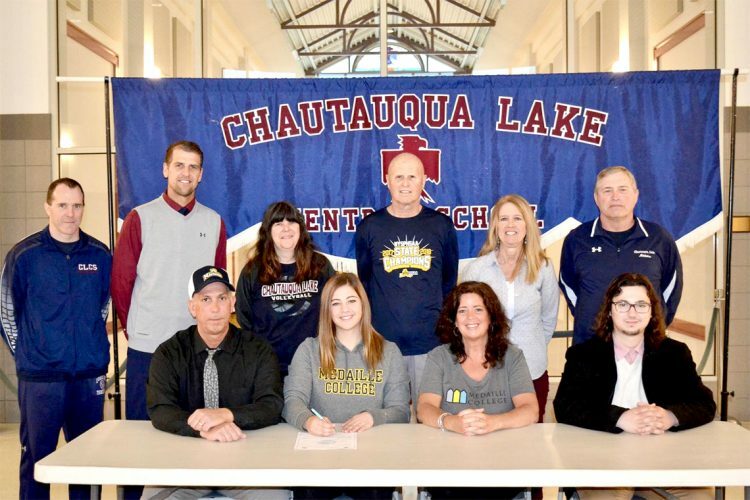 Portia Nowosielski was selected the Outstanding Girls Track Athlete by winning the 100-meter hurdles (16.26) and long jump with a distance of 15-10 1/2 as Harbor Creek took the girls team crown. 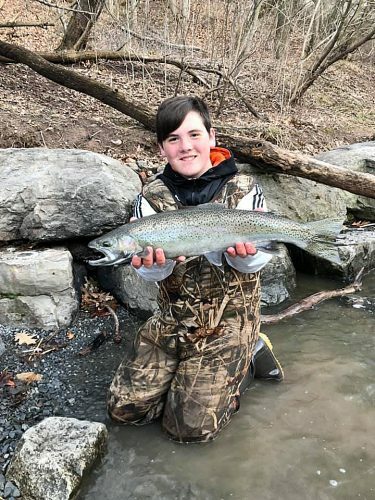 The Joe Paterniti Sportsmanship Award went to Nate Mogenhan of Southwestern for the boys and Morgan Perkins of Falconer/Cassadaga Valley for the girls. Kaniya Johnson of Olean set a meet record in the 100-meter dash with time a 12.61 to break the 12.62 mark set in 2013 by Christina Walter of Maple Grove. Joshua Walsh of Chautauqua Lake won the 100-meter for the boys with a time of 11.43. Brad Benson of Maple Grove claimed the pole vault for the boys with a vault of 12-0. 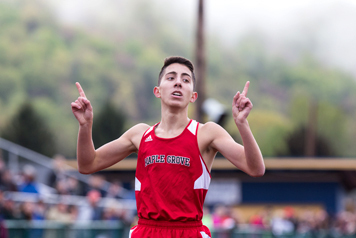 Also for Maple Grove, Michael Peppy crossed the finish line first in the boys 1,600-meter run with a time of 4:31.92. Eddie Scroxton of Southwestern was second in 4:36.33. 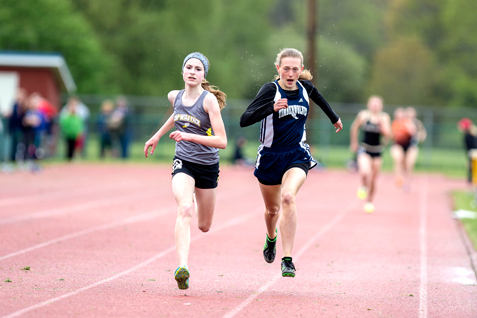 Kylee Odell of Clymer/Sherman/Panama was first in the 1,500-meter run with a time of 4:58.30, edging Bailey Gostomski of Cattaraugus-Little Valley by less than a second. Abby Gostomski won the 400 meters in 59.99, just ahead of Maple Grove’s Caroline Walter (1:00.38). Abby Gostomski was also second in the long jump with a 15-6 1/2. Kylie Schnars of Clymer/Sherman/Panama won the girls high jump at 4-11, with fewer attempts than Holland’s Jayna Galley. 3,200m relay: East Aurora (N/A), Harbor Creek, Falconer/Cassadaga Valley, Randolph, Southwestern. T — 8:15.15. 110m hurdles: Kellen Martin (C-LV), Michael Wolfgang (A-L), Dylan Young (HC), Carson Crist (MG), Noah Pullins (P). T — 16.06. 100m: Joshua Walsh (CLa), Jared Yaggie (S), Nate Mogenhan (S), Donovan Gayton (P), Cameron Kane (O). T — 11.43. 1,600m: Michael Peppy (MG), Eddie Scroxton (S), Ryan Starvaggi (HC), John Swabik (C/S/P), John Lyons (EA). T — 4:31.92. 400m relay: Olean (Daunte Jeter, Joey Copella, Cameron Kane, Shemar Turner), Chautauqua Lake, Portville, Southwestern, Fredonia. T — 46.20. 400m: Jared Yaggie (S), Donovan Gayton (P), Billy Seiders (SC), Drew Pownall (Frew), Harrison Monfort (J). T — 50.64. Discus: Dylan Perlino (H), Patrick Walsh (A-L), Michel Padilla (MG), Sam Wilczynski (HC), Mathew Waugh (P). D — 144-1. Long jump: Kellen Martin (C-LV), Henry Jakubczak (R), Shemar Turner (O), Seth Gibson (S), Nate McGill (HC). D — 19-5 1/2. Pole vault: Brad Benson (MG), Zach Carlson (P), Jason Angelo (HC), Wyatt Sluga (R), Cody Pool (J). H — 12-0. 3,200m relay: East Aurora (Molly McLaughlin, Eva Scarpa, Megan McLaughlin, Maisy Webster), Westfield, Holland, Maple Grove, Fredonia. T — 10:00.81. 100m hurdles: Portia Nowosielski (HC), Lydia Lanski (Fred), Katja Kranzo (S), Brooke Weinman (F/CV), Giovanna Calamunci (J). T — 16.26. 100m: Kaniya Johnson (O), Emma Seiders (SC), Laural Erick (Fred), Samantha Gilbert (F/CV), Katie Wall (HC). T — 12.61. 1,500m: Kylee Odell (C/S/P), Bailey Gostomski (C-LV), Jaylah Cossin (SC), Madeline Curtis (HC), Ava Crist (MG). T — 4:58.30. 400m relay: Harbor Creek (Yvonne Nowosielski, Portia Nowosielski, Hope McQueeney, Katie Wall), Jamestown, Fredonia, Olean, Holland. T — 52.40. 400m: Abby Gostomski (C-LV), Caroline Walter (MG), Eva Scarpa (EA), Jillian Lawton (S), Grace DeCapua (A-L). T — 59.99. Shot put: Amber Morrison (F/CV), Cori Majcharzak (HC), Madison Palmer (EA), Alyssa Steen (MG), Elizabeth Izydorczak (H). D — 36-5 1/2. Long jump: Portia Nowosielski (HC), Abby Gostomski (C-LV), Lexy Alexander (F/CV), Julia Rak (H), Marisa Schuppenhauer (MG). D — 15-10 1/2. High jump: Kylie Schnars (C/S/P), Jayna Galley (H), Kaitlyn Bulega (H), Marina Miketish (O), Clarie Stokes (Fred). H — 4-11.